Active since the Sixties, LAM SpA is a reliable partner, experienced and technologically innovative. 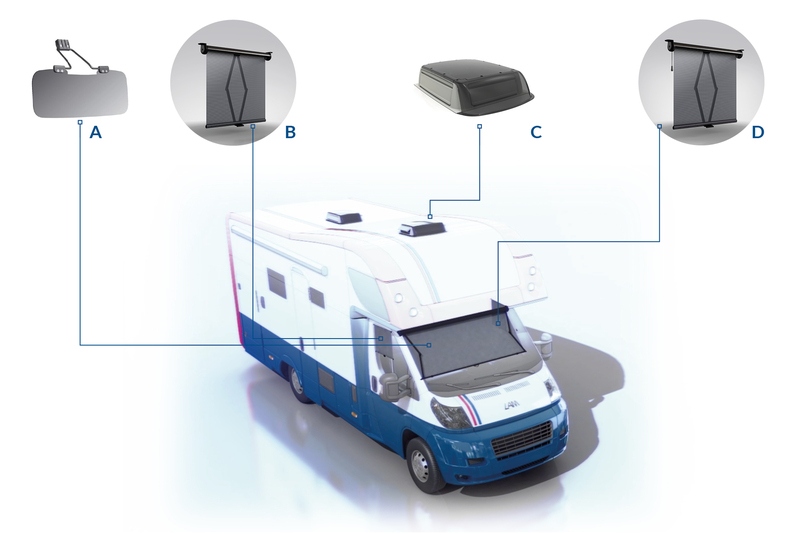 The Customer oriented philosophy of the company takes shape from the first phases of design, where customer commits to LAM SpA the study of custom-made solutions for the most disparate applications, affirming the company to be a consolidated partner for the major manufacturers in Camper, Motorhome and Caravan field. LAM SpA offers a wide range of sunshades. In pvc with different colors and dimensions and also in transparent material. A minimal solution for a quick installation. The TC4 model, thanks to the scissor arms system made of clutched plastic, doesn’t need any guide rods. Rotating fixing brackets with block every 15°, allow the fixing in many positions and inclinations. Made of transparent or obscured plastic material, LAM SpA roof hatches can be customized in many versions, and featured by high standards in quality and aesthetics, representing an excellent solution for the ventilation of the vehicle. The TC1 model, thanks to the plastic scissor arms system, doesn’t need any guide rods. It is equipped with lateral lever which allows to open and close completely the roller blind easily and quickly. Rotating fixing brackets with block every 15°, allow the fixing in many positions and inclinations. More standard and customized solutions available.